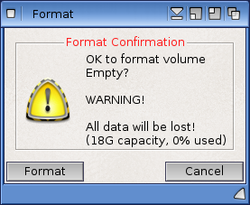 The Format command is used to erase a device or hard disk partition. It can be used from Workbench with it's user interface or alternatively as a command line program. WARNING: the Format process is a destructive operation and will erase data currently stored on the device or partition you are formatting. Ensure that any data you wish to keep is backed-up before starting the Format process. 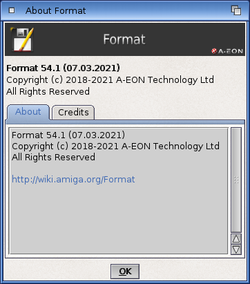 Format can be invoked from the Workbench by right clicking on a device icon and selecting the Format disk... option from the icons menu or it can be run directly from the System drawer by double clicking on it's icon. If you run it directly, the Format Select Device window will appear listing the available devices on the system. Alternatively Format command can be run directly from the CLI. Quick Format option is used, as the name suggests, to format the device or hard disk partition in the least amount of time. 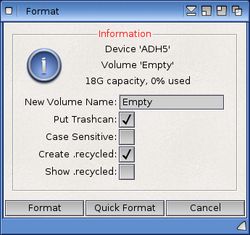 When this option is selected the device is not exhaustively erased block by block, but instead it is marked as formatted and available to be re-used and overwritten. Format option is a full format process where every block is erased exhaustively. As a consequence, for large devices or partitions it can take a very long time to complete the Format operation. These can be activated by clicking the associated tick box next to the option on partitions prepped with SFS v2. This page was last modified on 16 April 2016, at 13:55. This page has been accessed 61,724 times.